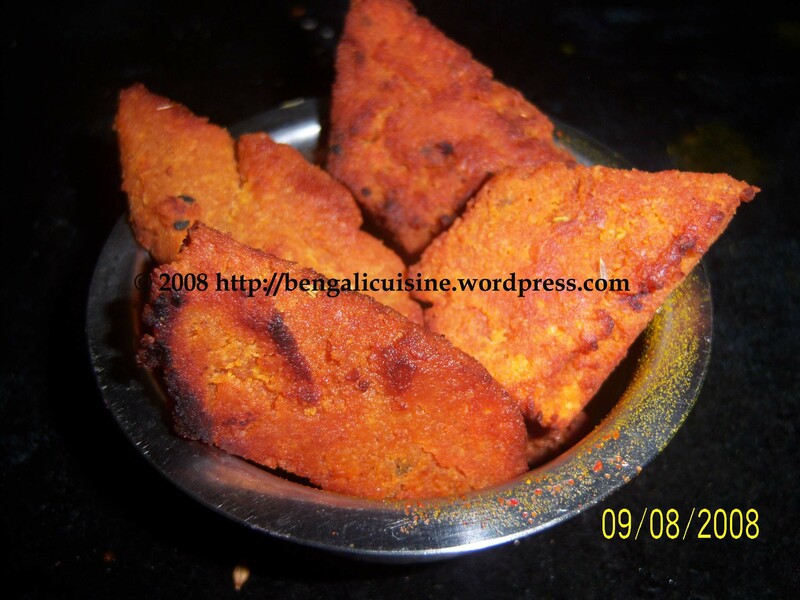 We’ve moved to own domain name – bengalicuisine.net. Please update your Bookmarks, Blogroll and Feeds. You can follow me on Twitter. I hope you all had loved the round up for The Non-Veggie Event. As for me, hosting an event for the first time was of great great pleasure. The recipes I received were so good and I felt pleasure in going through all the recipes. Each was better than the other. Chicken, mutton, eggs- everything was on the menu. I even tried out some of them and they were so yummy. So after all these meat and flesh and spices all over I thought of choosing something light and vegetarian for my next post. 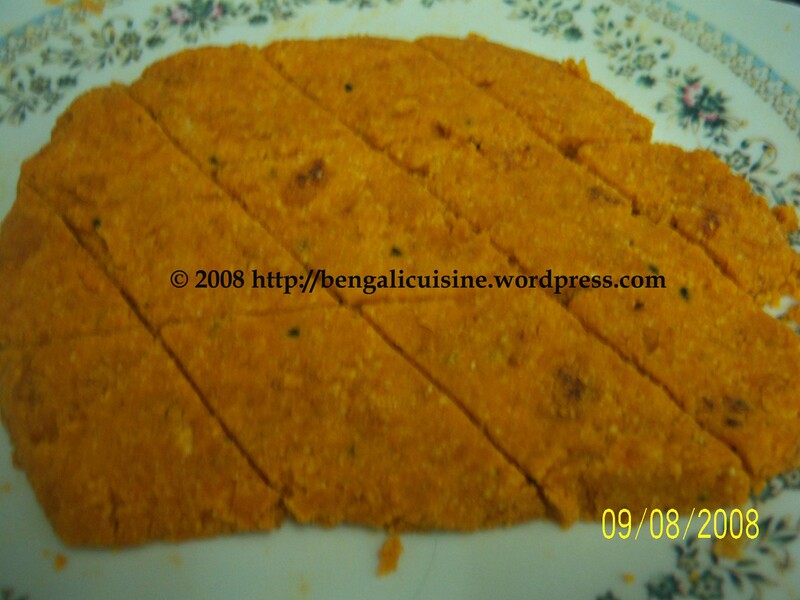 Dhokar dalna is one of the oldest recipes, which is of absolute Bengali origin. You will never find anything equivalent to this recipe. If any of you have anything which you feel is similar to Dhokar Dalna, then please do write a comment on that. Even better of you please post it on your blog and leave a comment along with the URL of the post. I found my mother cooking many items and calling them with the same prefix “Dalna”. I took this opportunity to search about what Dalna actually means. My source was noone but my inspiration of cooking , my MOM. After partition many people came from East Bengal, now better known as Bangadesh. In present Bengal (West Bengal, India) they are popularly known as Bangal(as in Bangladesh) and those who were actually from present West Bengal are called Ghoti. As the language changes with every mile, so here also there is no exception. What the Bangal call tarkari (curry) the Ghotis call it Dalna. So, this Dhokar Dalna most probably originated from the people who were the oldest inhabitants of present West Bengal. There are many more stories of this differetiation in every part of Bengal. If I start writing I’ll never ed, so better keep it for future. Dhoka is a mixture of two types of pulses, and the curry with very little spice is called Dhokar Dalna. Grind both the pulses together in a powder. Grind it well so that it becomes absolutely powdery. Alternately you can also soak the pulses for about 2 to 3 hours and then make a paste of the soaked pulses. Add salt, ½ teaspoons each of turmeric powder, ½ teaspoons of red chili powder, turmeric powder, black pepper, cumin seeds; refinedwheat flour, sugar, asafoetida, cinnamon powder, cardamom powder and 1 teaspoon of nigella to the dough. If you have dry grinded the pulses then add water and make thick dough. Keep it for 20 to 30 minutes. Heat ½ teaspoons of oil in an wok. Add the dough and toss for 2 to 3 minutes or till the dough become quite dry. Spread the tossed dough over a plate with almost an inch depth. Cut it into small diamond shapes. The dhoka is now ready to fry. Heat oil in a frying pan and fry the dhokas till they get hard and the inside also gets cooked. You can prick them with a knife. If the knife comes out with sticking, then the inside is also cooked. Cut thepotatoes in medium size square pieces. Heat oil in a wok. Fry the potatoes till they are golden brown. Add the cumin seeds to it along with turmeric and chili powder. Pour in water and salt. Now cook till the gravy thickens and the potatoes are cooked well. Carefully drop the dhokas and just boil for 2 minutes in low flame. Do not toss else the dhokas will break. Take it out of flame and Dhokar Dalna is ready to serve. 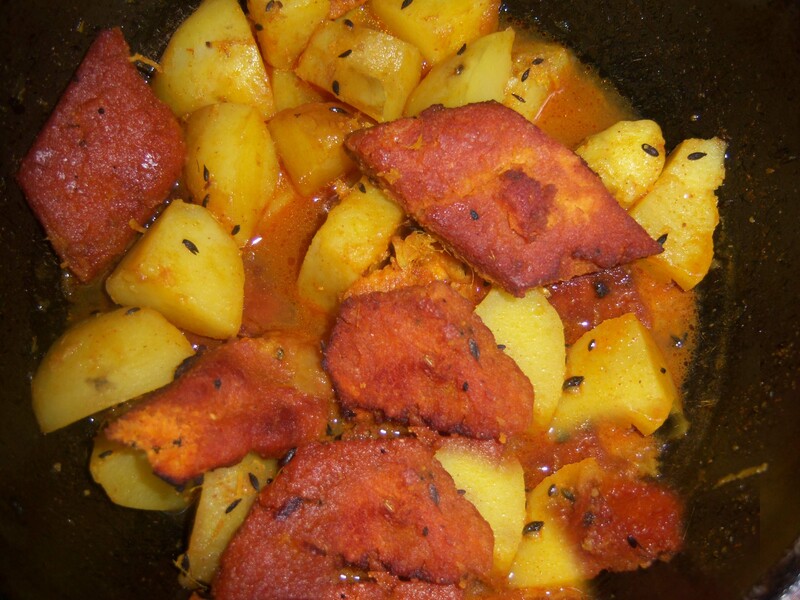 Dhokar Dalna serves as a wonderful side dish for vegetarian meals. Try it out and send me your comments. Keep in touch and till then HAPPY COOKING AND HAPPY EATING.